I have been eyeing one nail polish for a week and a view days ago I decided to just buy it. The nail polish is Pedal to the metal by Sally Hansen. At first I wasn't sure if it was a silver nail polish or a silver one with a pink tone to it. But when I came home I was like sh*t this is silver and I already have a gorgeous silver nail polish ! I still wasn't sure after wearing it a day if it was just a metallic silver or if it had a pink tone to it. I even applied my other silver nail polish [ Her majesty - Rimmel] to my pinkie to compare. 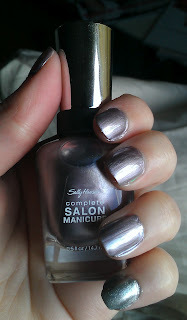 I also love to wear this nail polish with Save me [ OPI ] on top of it or A cut above [Essie]. And the important thing is that it doesn't chip that fast, it stays on perfect even without a top coat.